The organizers of the 1945 United Nations Conference to forn a new International Organization in San Francisco, California, wanted an insignia that could be made into a pin to identify delegates. United States Secretary of State Edward Stettinius, acting as chairman of the U.S. delegation, formed a committee to design such an emblem for the pin. The committee, headed by Oliver Lundquis, approved the now famous design, consisting of a world map surrounded by leaves, which was created by Donal McLaughlin. Note: Agency descriptions used on this page rely heavily on Wikipedia, the free encyclopedia, for text, images, and information. This flag appears on the bottom of an old World War II Pin Map as one of 10 flags of the United Nations. Five of these flags are shown with olive branches on them and five without, but all are listed as "Provisional Flags of the United Nations." Because of aging, the background color on these flags is unsure, ranging from green to blue, and the flags are not documented elsewhere. 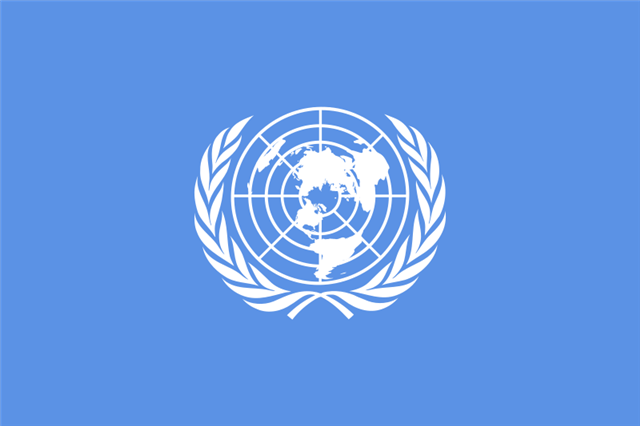 It should be pointed out that the term "United Nations" was used as a synonym for "Allies" as early as 1942 (coined by Franklin D. Roosevelt, later formalized in the "Declaration of United Nations"), but this flag doesn't necessary have any connection with United Nations linage. It is similar to the "United Nations Honor Flag" in this respect. Based on Donal McLaughlin's United Nations emblem design, the first United Nations flag was approved in 1945. The light blue field was chosen because it was "the opposite of red, the war color." The exact shade of light blue has never been officially specified by the United Nations and has varied slightly over the years. The globe used in the original design was an azimuthal projection focused on the North Pole with the United States, the host nation of the conference, at the center. The olive branches where used as symbols of peace, and the world map was meant to represent all the people of the world. White and blue where chosen to be the official colors of the United Nations. 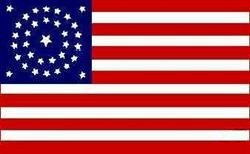 This flag was first flown in San Francisco, California, during meetings of the United Nations organization. In 1948 the map projection was altered on the United Nations so that no country would be at the center of the flag. The new map was designed so that the globe is bisected in the center by the Prime Meridian and the International Date Line. Since the earlier version had the globe 90 degrees turned eastward compared with the present flag, the change was made to move North America away from the center of the emblem. This became the permanent design and is still used on the United Nations flag. The Academic Council of the United Nations (ACUNS) is a global professional association of educational and research institutions, individual scholars, and practitioners active in the work and study of multilateral relations, global governance, and international cooperation. Almost half of its membership is based in North America, Europe and Central Asia; but their global membership comes from 54 countries. Its 600 individual and institutional members include scholars, UN and other international organization practitioners, NGO/civil society representatives, government officials, and interested individuals. Its flag is UN blue with its white logo in the center of the flag. The logo is a torch sorrounded by Un oil leaves, and its abbreviation over the emblem. The International Atomic Energy Agency (IAEA) is an international organization that seeks to promote the peaceful use of nuclear energy, and to inhibit its use for any military purpose, including nuclear weapons. The IAEA was established as an autonomous organization in 1957. Although independent of direct United Nations control, the IAEA reports to both the UN General Assembly and Security Council. 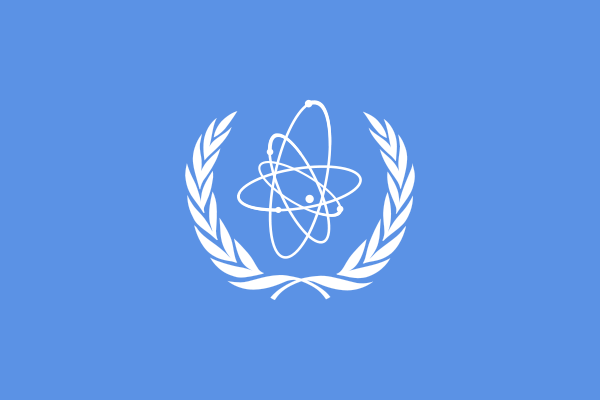 The International Atomic Energy Agency uses a flag with the same colors and olive leaves as the United Nations, but with a central symbol of a Rutherford model atom. 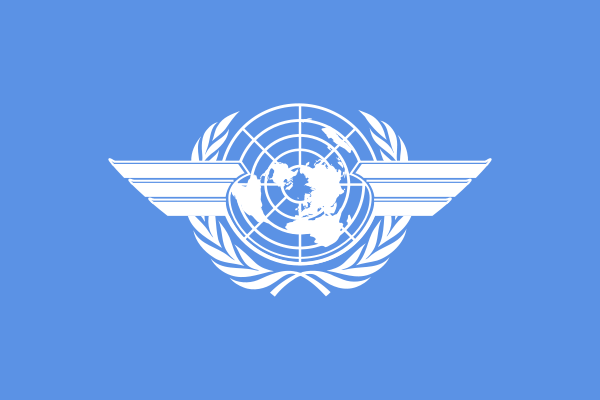 The International Civil Aviation Organization (ICAO), a specialized agency of the United Nations, codifies the principles and techniques of international air navigation and fosters the planning and development of international air transport to ensure safe and orderly growth. Its headquarters are located in the Quartier International of Montreal, Quebec, Canada. The flag of the International Civil Aviation Organization is that of the United Nations with pilot's wings superimposed over the emblem. The International Criminal Court (ICC or ICCT) is a permanent tribunal to prosecute individuals for genocide, crimes against humanity, war crimes, and other crimes of aggression. The International Criminal Court uses the United Nations blue flag with the white wreath design, but replaces the world globe with the scales of justice at its center. There are two variants of this flag in use which use either a white or blue background with lines added on either sides of the wreath. July 17 has been named as the Day of International Criminal Justice. Events commemorating July 17 are aimed at raising awareness and generating support for global justice and the fight against impunity. The day is a celebration of the landmark steps that the international community is taking to reach to the common goal of global justice. The date was adopted by the Assembly of the States Parties during the Review Conference of the Rome Statute held in Kampala (Uganda) last year in June and marks the anniversary of the adoption of the Rome Statute, the founding treaty of the International Criminal Court (ICC). International Justice Day Flag is dark blue with its white emblem (without olive wreath) placed next to hoist, and its white name in three rows. The date (17 July) is written under the name with light blue letters. The International Fund for Agricultural Development (IFAD), a specialized agency of the United Nations, was established as an international financial institution in 1977. It was one of the major outcomes of the 1974 World Food Conference. IFAD is dedicated to eradicating rural poverty in developing countries. Seventy-five per cent of the world�s poor live in rural areas in developing countries, yet only 4% of official development assistance goes to agriculture. The International Fund for Agricultural Development is headquartered in Rome, Italy. The International Finance Corporation, a member of the World Bank Group, is the largest global development institution focused on the private sector in developing countries. "We create opportunity for people to escape poverty and improve their lives. We do so by providing financing to help businesses employ more people and supply essential services, by mobilizing capital from others, and by delivering advisory services to ensure sustainable development." The International Finance Corporation flag is white with its logo. It consists of a globe, abbreviation and name of the organization, and indication that it is a member of the World Bank Group. The International Labor Organization (ILO) is the specialized agency of the United Nations that deals with labor issues. Its headquarters are in Geneva, Switzerland. Its administration, and the people who are employed by it throughout the world, are known as the International Labor Office. The organization received the Nobel Peace Prize in 1969. 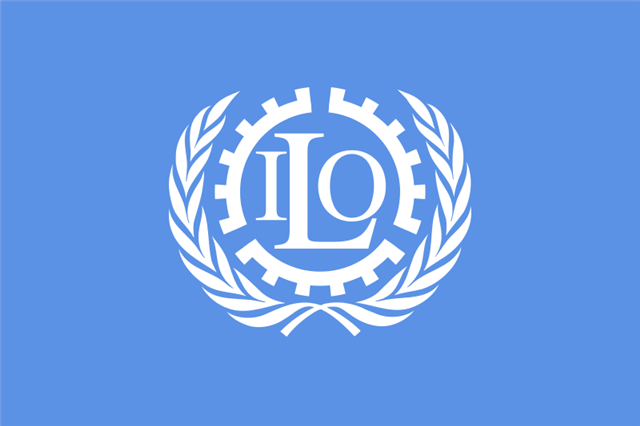 The flag of the International Labor Organization is the same design as used on the United Nations, but replacing the map with an interrupted gear wheel with the letters "ILO" inside it. 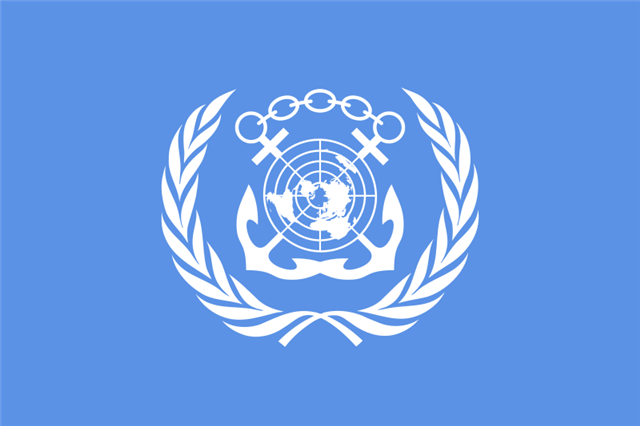 The International Maritime Organization (IMO), formerly known as the Inter-Governmental Maritime Consultative Organization (IMCO), was established in Geneva in 1948, but didn't begin for ten years, meeting for the first time in 1959. The IMCO name was changed to IMO in 1982. The International Telecommunication Union (ITU) is an agency of the United Nations which regulates information and communication technology issues. The ITU has coordinated the global use of the communications system, promoted international cooperation in assigning satellite orbits, worked to improve the telecommunication infrastructure, established worldwide standards for communications systems, and addressed the issue of strengthening cyber security. The flag of the International Telecommunication Union is United Nations blue and white with the ITU logo of a globe, red lightning bolt, and the letters "ITU." The Organization of World Heritage Cities (Organisation des villes du patrimoine mondial), headquartered in Qu�bec, Canada, has a flag of its own. The Organization of World Heritage Cities (OWHC) was founded in 1993 in Fez, Morocco. The organization is made up of over 233 cities (or sites) included on the UNESCO World Heritage List. They are located in Africa, Latin America, the Caribbean, Asia, the Pacific, Europe, Canada, and in the Arab States. The European International Model United Nations (TEIMUN Foundation) is a student organization which aims to educate students about the United Nations. The foundation organizes several conferences and participates in several other conferences and workshops to meet this goal. The highlight every year is the annual TEIMUN conference, which takes place every July. This year it will be held from the 11th till the 17th of July 2011 in The Hague, The Netherlands. TEIMUN gives students the opportunity to experience the working and decision-making process of the United Nations and NATO through role-playing in one of the organs simulated, helping participants to gain a multi-cultural view of world affairs and to develop public speaking and debating skills. Its flag is similar to UN flag, blue with UN badge in the center surrounded by its full name, and with its abbreviation under the badge. The United Nations Commission for Social Development (UNCSD) is one of the ten functional commissions established by the United Nations Economic and Social Council (ECOSOC) since 1946 to advise and assist ECOSOC in its work. The Commission for Social Development consists of 46 members elected by ECOSOC. Since the convening of the World Summit for Social Development in Copenhagen in 1995, the Commission has been the key UN body in charge of the follow-up and implementation of the Copenhagen Declaration and Programme of Action. As a result of the Summit, the mandate of the Commission was reviewed and its membership expanded from 32 to 46 members in 1996. It meets once a year at the United Nations Headquarters in New York, usually in February for about two weeks. The UN Development Program (UNDP), or "United Nations Development Programme," is headquartered in New York City at the UN headquarters building and is entirely funded by voluntary contributions from member nations. The UNDP operates in 166 countries, working with nations on their own solutions to global and national development challenges. As they develop local capacity, they draw on the people of UNDP and its wide range of partners. The UNDP provides expert advice, training, and grant support to these developing countries, with increasing emphasis on assistance to the least developed countries. The UNDP focuses on poverty reduction, HIV/AIDS, democratic governance, energy and environment, social development, and crisis prevention and recovery. UNDP also encourages the protection of human rights and the empowerment of women in all of its programs. Its flag has a UN blue field with its logo centered horizontally on the flag. The United Nations Environment Program (UNEP) coordinates United Nations environmental activities, assisting developing countries in implementing environmentally sound policies and practices. It was founded as a result of the United Nations Conference on the Human Environment in 1972 and has its headquarters in Nairobi, Kenya. UNEP also has six regional offices and various country offices. The United Nations Educational, Scientific and Cultural Organization (UNESCO) is a specialized agency of the United Nations established in 1945. Its stated purpose is to contribute to peace and security by promoting international collaboration through education, science, and culture in order to further universal respect for justice, the rule of law, and the human rights along with fundamental freedoms proclaimed in the UN Charter. 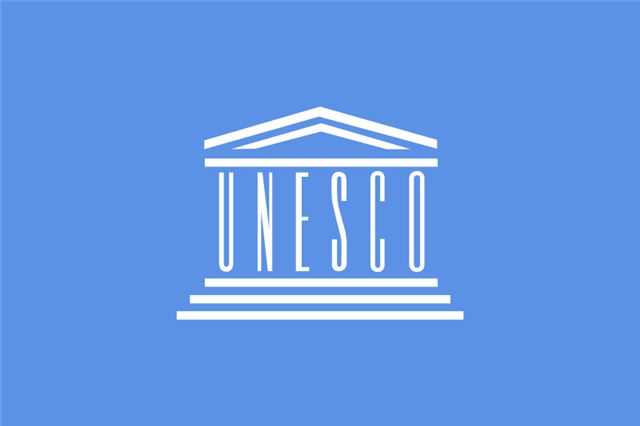 A UNESCO World Heritage Site is a place (such as a forest, mountain, lake, desert, monument, building, complex, or city) that has been chosen by the UNESCO as of "special cultural or physical significance." The list is maintained by the International World Heritage Programme, which is part of the UNESCO World Heritage Committee, members of which are elected by the the UN General Assembly. The World Heritage Site flag is white with their logo in red, surrounded by the name of the program in three languages, such as English, Swedish and Spanish as shown here, but can be changed to corresponds with the local city or place that has actually been selected to become one of the UNESCO World Heritage Sites. This is the flag of the Office of the United Nations High Commissioner for Refugees (UNHCR) which was established in 1950 as a United Nations agency mandated to protect and support refugees at the request of a government or the UN itself and assists in their voluntary repatriation, local integration or resettlement to a third country. Its headquarters are in Geneva, Switzerland. The United Nations International Children's Fund (UNICEF) was created by the United Nations General Assembly in 1946, to provide emergency food and health care to children in countries that had been devastated by World War II. In 1953, UNICEF became a permanent part of the United Nations System and its name was shortened from the original United Nations International Children's Emergency Fund, but it has continued to be known by the popular acronym based on its old name. Headquartered in New York City, UNICEF provides long-term humanitarian and developmental assistance to children and mothers in developing countries. 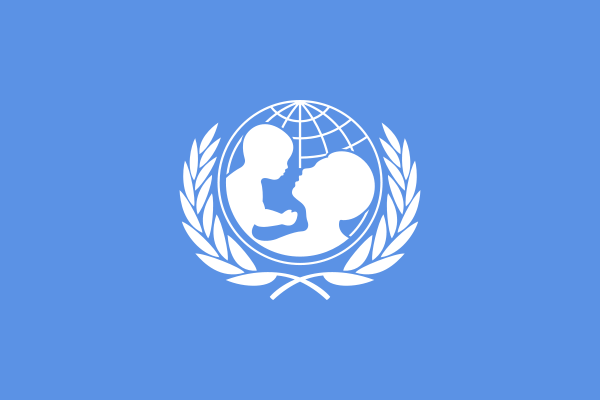 The flag of UNICEF has the leaves and globe of the UN flag but with a mother and child inlaid instead of the world map. The United Nations Industrial Development Organization (UNIDO), is a specialized agency of the United Nations headquartered in Vienna, Austria. The Organization's primary objective is the promotion and acceleration of industrial development in developing countries and countries with economies in transition and the promotion of international industrial cooperation. UNIDO promotes industrial development for poverty reduction, inclusive globalization and environmental sustainability. Its mandate is to promote and accelerate sustainable industrial development in developing countries and economies in transition, and work towards improving living conditions in the world's poorest countries by drawing on its combined global resources and expertise. Since 1979, the United Nations International Research and Training Institute for the Advancement of Women (UN-INSTRAW) has been the leading UN Institute devoted to research, capacity-development and knowledge management with the goal of achieving gender equality and women�s empowerment. UN-INSTRAW works in partnership with governments, the United Nations System, civil society and academia. A United Nations Parliamentary Assembly, or United Nations People's Assembly (UNPA), is a proposed addition to the United Nations System that eventually would allow for direct election of UN Parliament members by citizens of all over the world. Proposals for a UNPA date back to the UN's formation in 1945, but largely stagnated until the 1990s. They have recently gained traction amidst increasing globalization, as national parliamentarians and citizens groups seek to counter the growing influence of un-elected international bureaucracies. The "Campaign for the Establishment of a United Nations Parliamentary Assembly" was formed in 2007 to coordinate pro-UNPA efforts, which as of February 2009 has received the support of over 600 Members of Parliament from over 90 countries worldwide. The United Nations Volunteers (UNV) program is the UN organization that promotes volunteerism to support peace and development worldwide. It is built around the theory that "volunteerism can transform the pace and nature of development, and it benefits both society at large and the individual volunteer. UNV contributes to peace and development by advocating for volunteerism globally, encouraging partners to integrate volunteerism into development programming, and mobilizing volunteers." The Universal Postal Union (UPU) is an international organization that coordinates postal policies among member nations, and hence the worldwide postal system. Each member country agrees to the same set of terms for conducting international postal duties. The Universal Postal Union's headquarters are located in Berne, Switzerland. The flag of the Universal Postal Union is UN blue with the organization's logo in white. World Bank is basically an international financial institution that provides loans to developing countries for capital programs. The World Bank has a stated goal of reducing poverty. The World Bank is one of five institutions created at the Bretton Woods Conference in 1944. Delegates from many countries attended the Bretton Woods Conference. Based in Washington, D.C., the World Bank is by custom headed by an American. 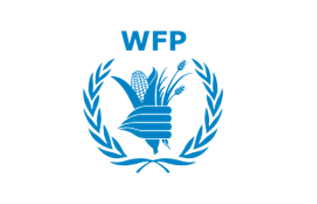 The World Food Program (WFP) is the food aid branch of the United Nations, and the world's largest humanitarian organization addressing hunger worldwide. The World Food Program provides food, on average, to 90 million people per year, 58 million of whom are children. From its headquarters in Rome and more than 80 country offices around the world, WFP works to help people who are unable to produce or obtain enough food for themselves and their families. 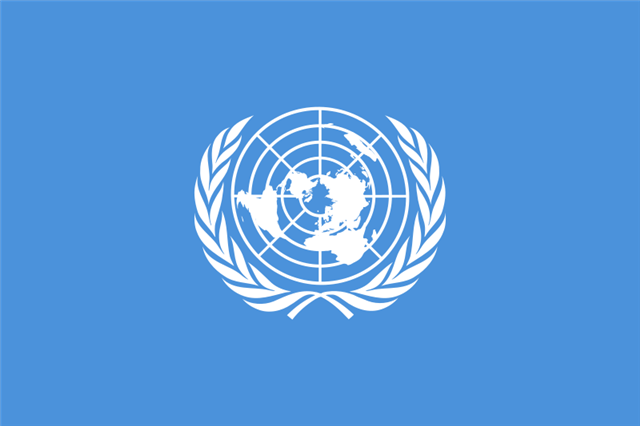 The flag of the World Food Program has the olive leaves of the UN flag, with a hand clutching grains in the center, in place of the globe. The white/blue colors of the UN flag are reversed in the WFP flag. The lettering itself can be changed or extra added to the flag using any of four languages, English (WFP - World Food Program), French (PAM - Programme Alimentaire Mondial), Spanish (PMA - Programa Mundial de Alimentos), and Arabic (full Arabic text), depending on the location or use of the flag. The World Health Organization (WHO) is a specialized agency of the United Nations that acts as a coordinating authority on international public health. Established in 1948, and headquartered in Geneva, Switzerland, the agency inherited the mandate and resources of its predecessor, the Health Organization, which had been an agency of the League of Nations. The flag of the World Health Organization is identical to the UN flag, with the addition of a yellow-gold Rod of Asclepius, a traditional symbol of medicine. The Rod of Asclepius on some variants is sometimes shown in a matching white instead of yellow-gold. The World Intellectual Property Organization (WIPO) is a specialized agency of the United Nations. It is dedicated to developing a balanced and accessible international intellectual property (IP) system, which rewards creativity, stimulates innovation and contributes to economic development while safeguarding the public interest. The predecessor to WIPO was the United International Bureaux for the Protection of Intellectual Property (BIRPI), which had been established in 1893 to administer the Berne Convention for the Protection of Literary and Artistic Works and the Paris Convention for the Protection of Industrial Property. The current WIPO was established by the WIPO Convention in 1967 with a mandate from its Member States to promote the protection of IP throughout the world through cooperation among states and in collaboration with other international organizations. The WIPO has 184 member states, and administers 24 international treaties. It seeks to link over 300 intellectual property offices (IP offices) in the WIPO Member States. Its headquarters are in Geneva, Switzerland. The image of the newest WIPO flag was originally produced by the World Intellectual Property Organization (WIPO), and they are the owner of the copyright. The World Meteorological Organization (WMO) is an intergovernmental organization with a membership of 189 Member States and Territories. It originated from the International Meteorological Organization (IMO), which was founded in 1873. Established in 1950, WMO became the specialized agency of the United Nations for meteorology (weather and climate), operational hydrology and related geophysical sciences. It has its headquarters in Geneva, Switzerland. 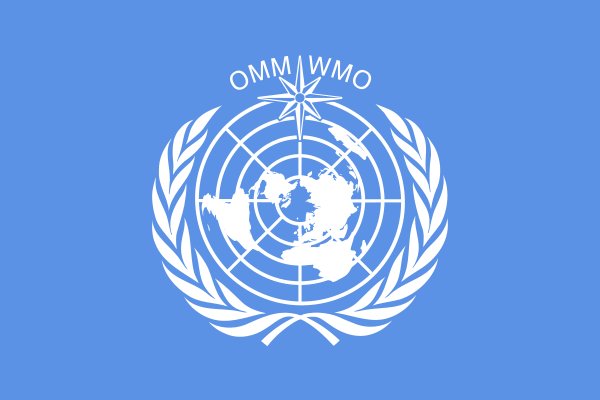 The flag of the World Meteorological Organization is that of the UN with a compass rose and the letters "OMM/WMO" atop the globe. Normally United Nations Military Forces don't use special flags, but fly the standard United Nations flag and wear light blue helmets and arm bands clearly identifying them as troops representing the United Nations. That said, there have been exceptions. The Special Court for Sierra Leone (SCSL), or United Nations Aid Mission to Sierra Leone, was set up jointly by the Government of Sierra Leone and the United Nations. It is mandated to try those who bear the greatest responsibility for serious violations of international humanitarian law and Sierra Leonean law committed in the territory of Sierra Leone during and after the Sierra Leone Civil War. The court is located in Freetown. Currently, the most well-known trial is that of former Liberian President Charles Taylor, which is in the defence phase and has been moved for security reasons to The Hague and its physical plant of the International Criminal Court. It is, however, still being conducted under SCSL auspices. UNCMAC refers to the United Nations Command Military Armistice Commission, and has been operating from the beginning of the Korean War armistice in 1953 to the present, monitoring the ceasefire in place between North Korea and South Korea. United Nations forces still patrol the DMZ (Demilitarized Zone) today. Since war was never "officially" declared in Korea and a peace treaty has never been signed, it is perhaps the longest "cease fire" in modern history in a war that has never "officially" begun or ended. A closely related flag to the UNCMAC flag would be Neutral Nations Supervisory Commission of Korea flag. To learn more click on the name above. The United Nations Operation in the Congo (Opération des Nations Unies au Congo) took place in the Republic of the Congo between 1960 and 1964. At the height of the mission there were almost 20,000 troops from thirty-four different countries involved in the peacekeeping mission. ONUC was established in 1960 to ensure the withdrawal of Belgian forces and to assist the new Republic of the Congo government in maintaining law and order and to provide technical assistance. The mission headquarters of ONUC was in Leopoldville (now Kinshasa). Many of the participating UN Troops used special flags to identify their national forces. An example of this is the flag used by the Canadian forces which was very similar to their current national flag, but with blue bands and with a red maple leaf with extra points. Originally, UNIFIL was created by the Security Council in 1978 to confirm Israeli withdrawal from Lebanon, restore international peace and security and assist the Lebanese Government in restoring its effective authority in the area. The mandate had to be adjusted twice, due to the developments in 1982 and 2000. Following the 2006 crisis, the Council enhanced the Force and decided that in addition to the original mandate, it would, among other things, monitor the cessation of hostilities; accompany and support the Lebanese armed forces as they deploy throughout the south of Lebanon; and extend its assistance to help ensure humanitarian access to civilian populations and the voluntary and safe return of displaced persons. This flag is not in general use and rarely seen. Most buildings, vehicles, check-points and all UN installations today generally use the standard UN flag. Initially the United Nations Mission in Croatia (UNPROFOR) was established in Croatia to ensure demilitarization of designated areas. The mandate was later extended to Bosnia and Herzegovina to support the delivery of humanitarian relief, monitor "no fly zones" and "safe areas." The mandate was later extended to the former Yugoslav Republic of Macedonia for preventive monitoring in border areas. 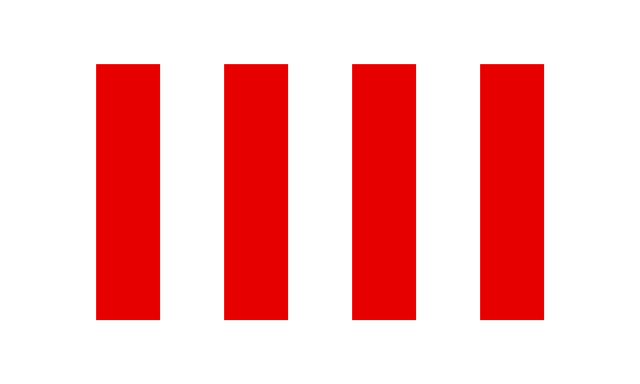 This flag was allegedly used by UNPROFOR during their mission in Croatia in the 1990s. This flag was supposedly hoisted at the UNPROFOR headquarters in Zagreb in Selska Street. The flag is white with light blue UN emblem, basically the United Nations flag with inverted colors. The United Nations Observer Mission in Georgia (UNOMIG) was established by United Nations Security Council in 1993 to verify compliance with a 1993 ceasefire agreement between the Republic of Georgia and forces in Abkhazia, especially around the city of Sukhumi. It was to investigate reports of ceasefire violations, attempt to resolve such incidents with the parties involved, and to report to the Secretary-General of the United Nations. About 88 military advisors were deployed to the region. The mission ended when Russia vetoed an extension of the mission, and the last observers left the region in 2009. The flag used was patterned on the UN flag, light blue with the white UN emblem in the middle, slightly moved upwards, flanked with a dark blue inscription on each side, being the abbreviation of the mission in English and Russian, and on the bottom the full name of the mission in English and in Russian. The United Nations Relief and Works Agency (UNRWA) for Palestine Refugees in the Near East is a relief and human development agency, providing education, health care, social services and emergency aid to over four hundred thousand Palestine refugees living in Jordan, Lebanon and Syria, as well as in the West Bank and the Gaza Strip. It is the only agency dedicated to helping refugees from a specific region or conflict. It is separate from UNHCR, the UN Refugee Agency, which is the only other UN agency aiding refugees, dedicated to aiding all refugees in the world. It was established following the 1948 Arab-Israeli War by the United Nations General Assembly in 1949. The United Nations Transitional Authority in Cambodia (UNTAC) was a United Nations peacekeeping operation in Cambodia in 1992�1993. Cambodia has had a very complex and confusing modern history. For many years Prince Sihanouk ruled as the virtual royal king of Cambodia, but he was never crowned as such. Between 1970-1975 the country was ruled as the Khmer Republic under the regime of General Lon Nol, who overthrew the Prince. Then the country was overrun by the marxist Khmer Rouge. This regime was, in turn, overthrown by the invading Vietnamese in 1979 and eventually a puppet regime was set up. This regime was not recognized by the United Nations which assumed control of the country in 1991. This was the first occasion in which the UN has taken over the administration of an independent state and assumed responsibility for promoting and safeguarding human rights at the national level. Eventually, they were able to organized and run a free election which was held in 1993 and saw an elected government consisting of a coalition of Cambodian factions made up of Prince Sihanouk's Fucinpec, the ousted Khmer Rouge, and Premier's Son Sann's resistance army assume power. During the time the country was administered by the United Nations, they used a light blue flag with a map of Cambodia in white on it. Cambodia's name was centered on the map in light blue. In 1999, the UN mission in the Congo was re-established as the United Nations Organization Stabilization Mission in the Democratic Republic of the Congo (Mission de l'Organisation des Nations Unies en République démocratique du Congo), or MONUSCO, was established and remains ongoing. This new United Nations peacekeeping force in the Democratic Republic of the Congo (DRC) was originated to monitor the peace process of the Second Congo War, though much of its focus subsequently turned to the Ituri conflict, the Kivu conflict and the Dongo conflict.